The second half of “Whom the Gods Love” was the harder of the two installments for me to write, and possibly (if I managed to do my job) for many to read. As a writer, I found it difficult for reasons both technical and emotional. I should say that the entire two-parter was originally conceived as a single episode. It was only once I started to post the season premiere–which, by the way, I began to do back in August but changed my mind–that I simply felt the weight of the story would be too onerous for readers to absorb in one shot. So apparently there is a limit, even in ASF, to how much misery I’m willing to inflict on the audience! The two halves separated themselves rather organically. First there was Justin’s death and the lead-up to his funeral; the second began with Hannah’s vigil for Heather and the re-introduction of Alicia Vasquez’s role in Hope’s life, which itself introduced an external conflict that briefly took Hannah’s mind off what was going on with Heather. It was also intended to do the same for readers–a mild sleight of hand to keep Heather’s fate almost backgrounded while Hannah was faced with a completely new conflict: growing concern over Hope’s future. Of course it also allowed me to slip in more unhelpfully vague hints about what happened to other characters we haven’t seen after the church massacre; now Daphne and Doug’s situation was teased without revealing any resolution yet. So while Hannah was briefly absorbed with the prospect of Hope disappearing from her tragically diminished family, we also learned more about her growing ‘selfishness,’ though I hesitate to use that term when referring to a woman who’s lost one child and waiting for news on her second. Perhaps ‘selfish’ is a poor description anyway; better descriptions would be overprotective, needy, desperate. The episode further let me show the receding influence of Nick on Hannah, and really, his loss of control over any situation whatsoever–throughout this, after spending all of last season in a powerful role culminating in masterminding the revenge he’s sought for so long, now Nick is forced into a situation he simply cannot influence. While Nick’s influence on Hannah recedes, Ryan’s begins to grow. Rather than explore their past relationship, or introduce some romantic tension, which is a route I’m certain some soap operas would have taken, I stayed as far away from that as possible. Instead I wanted to use Ryan to examine Hannah’s relationship with the Church and God. And not just hers; many people dealing with such a cruel situation have difficulties reconciling their faith in a just God with the random violence visited on an innocent child. Here we get to the technically difficult vs. emotionally difficult issues I had with this portion of the episode. Technically, I had to keep Hannah sympathetic while having her avoid Alicia’s (or really, Doug’s) perfectly understandable and legal requests to visit Hope; while rebelling against God Himself by showing such bitterness toward Ryan when he’s only trying to help her; while forcing her to acknowledge that yes, she can certainly be blamed for having brought her children into this dangerous life and choosing not to leave it behind, even after Heather had once been kidnapped already, even after Hannah was nearly killed herself. Obviously most people who have some ability to sympathize for fictional characters will feel something for a mother depicted as losing two children in such a short period of time. But I wanted to address all these uglier aspects of a woman in mourning, and I rewrote these scenes so many times in order to strike a balance between sympathizing with her and acknowledging her own mistakes and less-than-noble instincts. In the forum comments on this installment I’ve received some flattering compliments on ASF’s depiction of the ‘mob’ storylines. Once I wrote the Nicholses into ASF, I knew I had to tread carefully, because in adding an element like this, it’s so easy to turn them into caricatures, or worse, “good” mobsters. I definitely never wanted any glamorizing or idealizing of the criminal elements to this family, even when some of them are sympathetic. I don’t want there to be the aforementioned “good” mobsters, although even within the Nichols family there are varying degrees of what people are willing to do–just as I imagine there are in real life. Theirs is a violent and exploitative business, and I can’t imagine sugar-coating it. If there’s one rule I obey as an author it’s that I must always, always, show the consequences of people’s bad behavior. People don’t usually get off scot-free–even someone like Jem has to pay the piper in some way for what he does, regardless of whether it’s a legal ramification or a more personal one. I think that’s helped keep the Nicholses somewhat believable. They don’t have (complete) Plot Armor. Even right from the start, we saw the results of Nick’s activities on his wife: Hannah was introduced as a victim of her husband’s business via the assassination attempt that lost her ability to walk. The final technical issue begins to dovetail with the emotional difficulty: how to depict parents’ reactions to the loss of a child in a sensitive, believably grief-stricken manner without resorting to melodramatics and manipulation of the audience. I knew I wanted to avoid too much crying–I’m a firm believer in notion that the more tears you show on the page, the fewer tears you’ll engender from readers. If your entire cast is weeping and wailing every five minutes, the maudlin theatrics start to grate and the fictional seams begin to show. Nevertheless, it would be entirely unrealistic if Hannah weren’t crying at certain moments. I just had to make sure that there were just as many moments where she was frozen and unable to cry. I must have changed the scene in the chapel about five or six times, knowing that this had to be where Hannah made her decision to let Heather become an organ donor. All previous versions focused on Hannah’s belief in God, in Ryan’s saying the ‘right’ thing, on Hannah’s generosity… Each one worked, in its own way, but I was never satisfied. It was only when the bird-feeding anecdote struck me that I realized Hannah’s epiphany had to come from seeing Heather’s generosity, from Hannah’s belief in what Heather would expect of her. And when I hit on the idea of Hannah making the decision not just to give away Heather’s organs, but to continue to feed the geese for Heather’s sake, that I had what I felt was a moving and tragic way for Hannah to not just end her daughter’s life, but to envision the life she’ll have without her daughter. That’s when I knew the scene had taken the right direction at last. That takes me to the emotional aspect. As readers saw at the end of the episode, I dedicated this installment to my own brother, Kenny. Kenny was 10 when he died–from an accident that occurred before I was born. This year (2013) marks the fiftieth anniversary of his death. I won’t go into the details, but if you’re interested in the background, I wrote about the incident and the impact of his loss on my family earlier this year. While I never knew Kenny myself, I saw how my parents behaved years afterward, and (once I reached adulthood) learned/understood more about how they reacted immediately following the tragedy. Clearly this is something no parent should have to face, but I think a child’s death is even more likely to wreak havoc on a parent when that parent feels guilt for his or her loss. That was the case with my mother, and that was the dynamic I wanted to explore here, with the twins’ deaths. So I had to put myself in the mind of a woman who both felt responsible for the loss of her children, but also felt some resentment toward her husband too. Channeling this in a realistic way, depicting a family that doesn’t immediately come together in mourning, was painful for me. Of course Hannah has a far more direct reason for blaming Nick, while my mother primarily aimed her contempt inward. So the parallel isn’t 1:1, but it was close enough that I found myself understanding and sympathizing tremendously with Hannah when she acknowledged her role in her kids’ deaths. Anyway writing the episode became somewhat cathartic and it’s why I took such care in composing it. I’m sure it didn’t work for 100% of the readers–no episode does–but if a significant number of you were moved and felt Hannah’s arc was believable, I’ll be extremely gratified that I did what I set out to do. Thanks as always for letting me tell this story to you. 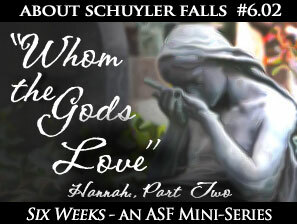 If you have any feedback on this installment, please don’t hesitate to write below or visit the official forum thread for “Whom the Gods Love,” Part 2.